Los Angeles Bar and Bat Mitzvah parties have some of the most creative and beautiful decor, and as photographers serving this market, we do our best to make sure that every detail of your beautiful design is captured. To ensure that we capture all the hard work you've put into planning your Bar or Bat Mitzvah party, we always try to take an overhead master shot of the party room. Whether it's from the vantage point of a tall ladder or well-located balcony, we will go to great lengths (and heights!) to capturing the overall vision you spent so much time crafting. We love the sweet and soft elegance of the pinks, golds and whites of this lovely decor, beautifully balanced by the more rustic branch centerpieces. 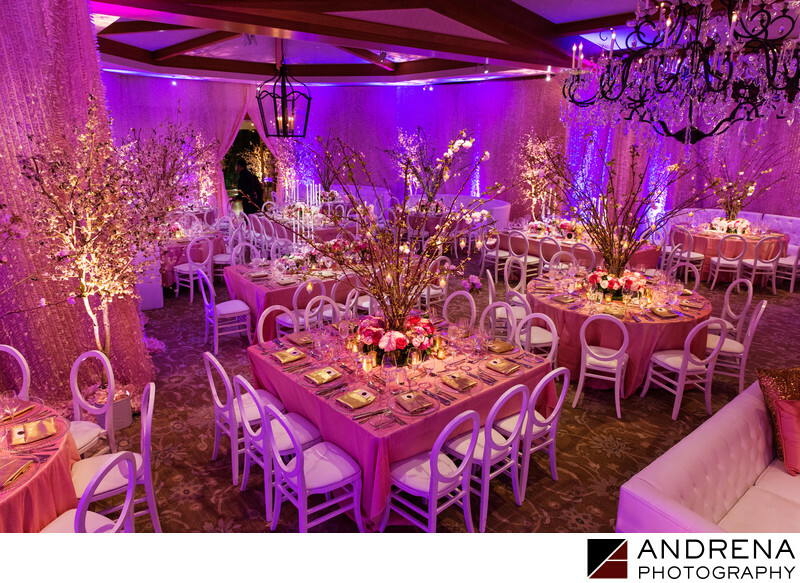 This room is whimsical, feminine and fun, which is a fitting tribute to the Bat Mitzvah girl.